"41UR315, Burial 38, Vessel 220" by Timothy K. Perttula and Robert Z. Selden Jr.
DECORATION (INCLUDING MOTIF AND ELEMENTS WHEN APPARENT): The rim panel has a series of engraved hooked arm scrolls around the vessel. These are divided by either single vertical lines that end in upper and lower triangles or by oval and diamond-shaped areas. The scrolls do not consistently have upper and lower scroll fill zones, but when they are present, they contain ovals and triangle elements. 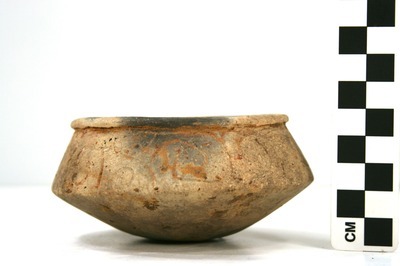 Taylor Engraved carinated bowl, Vessel 220, Burial 38.